The berry season is underway so why not take advantage of those fruity delights and mix them into a refreshing culinary surprise. Whether it’s a yogurt smoothie or an easy cobbler for the cookout, keep your eyes peeled. The berry mania is about to explode with the 4th of July fireworks. Although the strawberries are calling it a wrap, plenty of other berries are coming into their own. 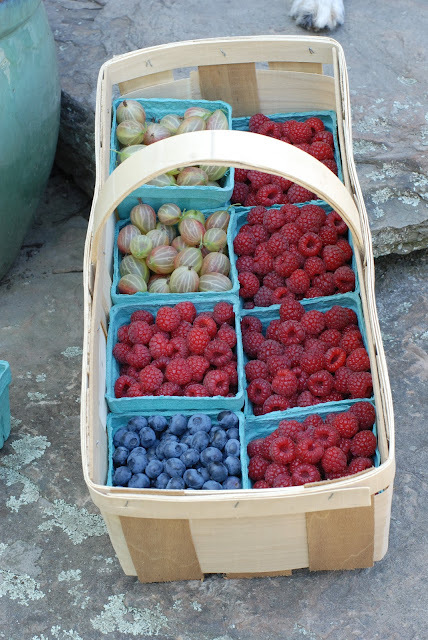 And if you don’t find growing berries berry interesting or just don’t have the time, check out a local farmers’ market for a fresh stash. You might discover a U-Pick berry farm while vacationing or enjoying a leisurely summer day out. So before you launch off for your festivities, here’s a funny quote attributed to Stephen Colbert. “Hey yogurt, if you're so cultured, how come I never see you at the opera?” The month of July and all its garden surprise is a great time to make that morning yogurt a bit more hip and add some berries to the mix! So off we go. It’s time to kick back and enjoy the summertime garden and the upcoming 4th. Happy Independence Day to all! Wow! I am drooling on those berries. They looks really delicious. Nice page.